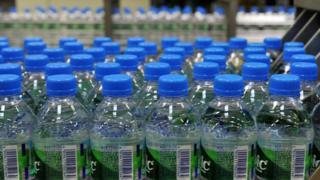 About 3.7 million bottles of Volvic mineral water are being recalled in Japan, over fears pieces of plastic have got into some of the products. Local distributor Kirin Beverage said part of a bottle-filling machine in the French Volvic factory had been damaged, and fallen into the water container. Kirin apologised but said there had been no reports of any health problems. The voluntary recall applies to 500ml plastic PET bottles of Volvic with an expiry date of October 2019. The affected water was distributed across Japan, with the exception of Kyushu and Okinawa. "Although black plastic pieces float on the liquid surface, there is a possibility of injuring the oral cavity when you put it in your mouth without noticing it." Kirin said. "We have confirmed that it meets the safety standards used for foods and does not affect the content of the liquid. Volvic, Japan's biggest selling water brand by sales, is owned by French food group Danone. Kirin and Danone formed a joint venture in 2002, specifically to market Volvic in Japan.